“We support each other with Pride." 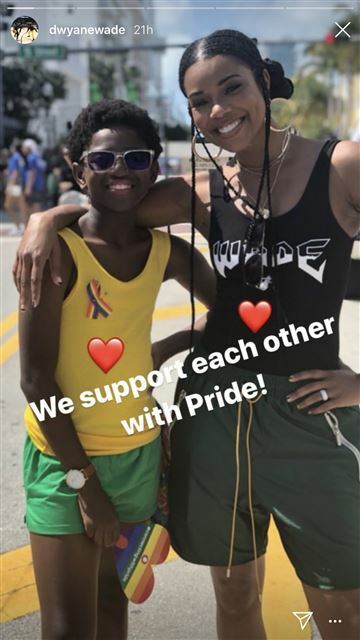 Dwyane Wade couldn't be in Miami this past weekend when his 11-year old son, Zion, took part in the Miami Beach Pride festivities, but the future NBA Hall of Famer made sure to show his public support on social media. Wade's son Zion appeared at the parade with other members of his family including his brother Zaire and stepmom, Gabrielle Union. As it stands now, the Heat are one-game back of the eighth seeded Detroit Pistons with just two regular season games remaining. Following Tuesday's home game against the Sixers, the Heat will travel to Brooklyn for what could very likely be the final game of Wade's career.